TS PGECET Counselling 2018: TS PGECET is a yearly-state level exam conducted to provide admission in graduate-level post-baccalaureate, ME, M.Pharmacy, M.Tech, and M.Arch. These Courses are offered by state level institutes and colleges. The TS PGECET Exam is going to start from 28th May 2018. After it, the result will be declared and then the TS PGECET counselling 2018 will be conducted. To participates in the counselling procedure candidates have to qualify the examination with more than cut-off marks. 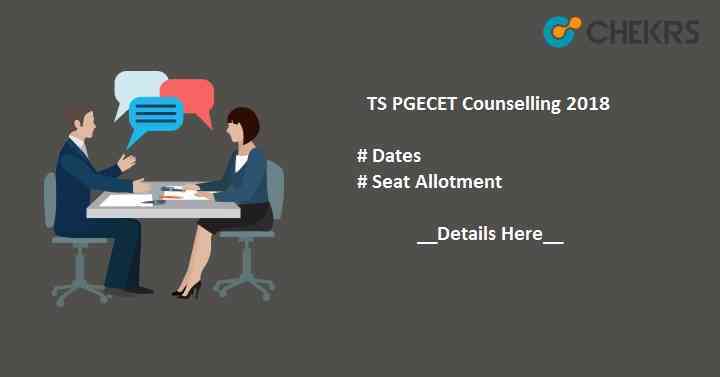 In this article, we are providing you all the information about TS PGECET counselling 2018. The counselling will be organized in the month of August. The counselling will be organized separately for candidates from GATE exam (GATE: 2016, 2017, 2018, GPAT 2018) and qualified candidates of TS PGECET Exam. The complete schedule will be available online. The above-tabulated schedule will be updated after the official announcement. The complete procedure is provided here. You can understand all the basic steps of this counselling procedure. All the qualified candidates will be called for TS PGECET registration procedure on the basis of rank. Candidates have to register for the counselling and they also have to pay the counselling All these details will be given in the registered Email or through the official site. After it, candidates have to verify and submit their Documents and certificates at the helpline center. They have to bring all original certificates with a photocopy. They will receive the receipt of their document. Check all the details on it. After it Candidates have to log in to the official website using the Hall ticket number, DOB and Rank after it they have to follow the choice filling procedure. Candidates have to fill preferred course and institute there. Candidates are advised to fill a maximum number of preferred choices. TS PGECET Seat Allotment Rank Wise will be conducted after choice filling procedure. Seats will be allotted to all the eligible candidates on the basis of Their Rank, reservation, choice-filled, and seat availability. After the seat allotment, candidates have to check their allotted seat and allotted institute on the official website. After it, Candidates have to report at the allotted college/institute for the further admission procedure.